Welcome to Morningside! Bienvenidos. Habla Español? We want your first visit to Morningside to be refreshing and enjoyable for your whole family. You will experience inspiring music, helpful teaching, friendly people, and a place where you feel welcomed. Here are a few things that will make your first visit to Morningside a great experience. Each service provides an opportunity for you to connect and grow closer to God through inspiring music, practical preaching, and a friendly atmosphere. Our services last about one hour. Our desire is to turn our focus toward God because worship is for His glory, not our own. We also offer Spanish, Chinese, and Arabic services. At the Sunday 10:30 am service, we take a minute to greet each other, but don’t feel like you need to leave your seat. We'll come and greet you. Baby and childcare are provided at every service time. Upon entering our property, you will find clearly marked parking for our guests and those with disabilities. Please enter the building through the entry way from All Star Way marked with large potted plants. When are the weekly services? 1st Morning Worship Service (English/Spanish/Chinese/American Sign Language) 9:15 a.m.
1st hour Sunday School classes (English/Spanish/Chinese) 9:15 a.m.
2nd Morning Worship Service (English/Spanish/Chinese/American Sign Language) 10:30 a.m.
2nd hour Sunday School classes (English/Spanish/Chinese) 10:30 a.m.
Evening Family Service (English/Spanish/Arabic/American Sign Language) 5:30 p.m. Kids on Mission (Grades 1-5) & Youth Group (Grades 6-12) 6:45 p.m. Prayer Meeting (English/Spanish/Chinese) 7:00 p.m.
How can the Welcome Center help? In the center of our building near the fountain is the Welcome Center where you can find answers to questions, such as, "Where do my children go to class? Where should I go?" Someone at the desk will be happy to answer any question you may have. Where do I take my infant or toddler? At every service there are safe, clean, well-equipped rooms and well-trained staff and volunteers to care for children 0 to 3 years of age. You will be asked to give your cell phone number at check-in so that the nursery staff can easily contact you if there is a need. From start to finish, we strive to make your families’ time with us a great experience! We seek to make this your child’s favorite day of the week. We use skilled volunteers, technology, fun activities, and excellent environments to communicate the timeless knowledge of our loving God. We believe this makes our kids' ministry a place your child will be asking you to bring them back to each week. Classes take place at each of our worship services. At Morningside, we don't have a dress code. Our desire is to display a respect for God, but we don’t believe that formal or casual clothes are inherently more spiritual. At our services, you'll see people in suit coats, some in jeans, and some in suit coats with jeans. No, we do not invite you to our church for your money. We hope that the worship and fellowship will be a gift to you, so please don’t feel obligated to give during the offering time. Our prayer is that you will receive the greatest gift, if you haven’t already. Pastor Crockett preaches sermons directly from the verses of the Bible. If you have a Bible you'll want to bring it or download one to your phone, so that you can follow along with his teaching. His sermons are Christ-centered and practical, emphasizing Gospel applications for real life. We are a church family that welcomes all to come and experience God's grace. At the doors, you will be welcomed by our Greeter Team who will direct you to where you want to go. If you are our guest for the first time, please come by the Guest Services table in the lobby and pick up a 16 ounce coffee mug with biscotti, as our gift to you. We want you to know how much we appreciate your joining us for a Sunday worship service. How do I meet the pastor? After the service, Pastor Crockett and his wife, Karie, stand in the mall area of the main lobby in front of the fountain. Other pastoral staff are available at the main exit doors after the Sunday morning service. We would also love for you to sign up to attend a Starting Point class. In our Starting Point class you will be able to meet our pastors and staff members. You will learn about the history, philosophy, and vision of Morningside. We will also share ways you can find your place as an engaged member at Morningside through our various ministries. As time allows, we will try to answer your questions. An optional tour is available at the end of the night. Sunday school at 9:15 on Sunday morning is a time to learn God’s Word in smaller groups where you can build relationships. We have Sunday School classes for all ages: Nurseries; Children, K4–Grade 5; Middle School, Grades 6–8; High School, Grades 9-12; Rooted College Students (age 18-22); Pursue Young Adults (age 23-27); Steadfast (career adults) and Adults. Greeters will direct you to the classes that work best for your family members. What translations does Morningside use? For uniformity, the preaching in our English services is from the King James Version 1769 edition, however, we are not “King James Only.” We encourage members to study God's Word using multiple translations. As the King James translators stated in their preface, "Variety of Translations is profitable for the finding out of the sense of the Scriptures" (Preface to 1611 Translation, xiv). 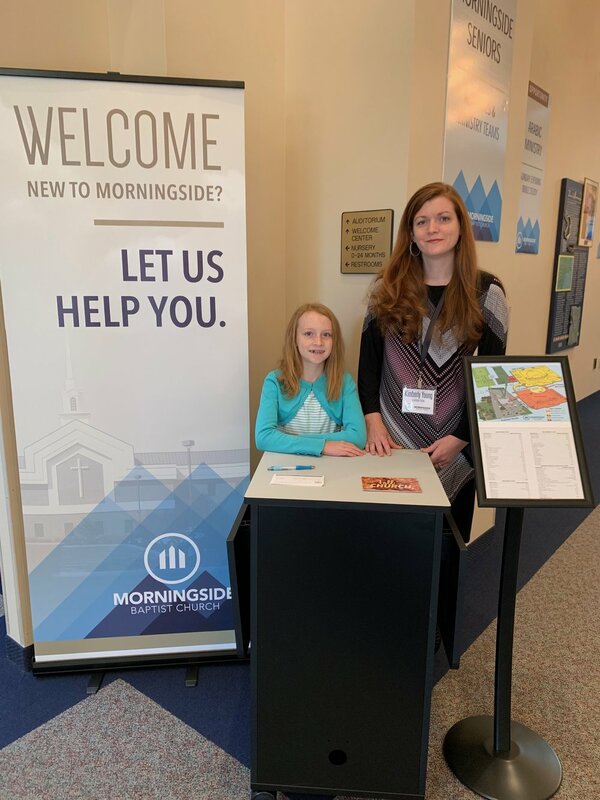 If you have more questions, you may find your answer on this website, or you are welcome to call our office at (864) 297-7890 or email us at Info@morningside.org.